The economic viability of an energy system that saves money for utilities and consumers by reducing demand peaks on the electrical supply grid has been demonstrated by a prototype energy lab at The University of Alabama in Huntsville (UAH), its creator says. "On a cold winter morning, when all the businesses open and residents wake up and turn on the heat, the drain on the power grid can be enormous," says lab developer Dr. Bill Carswell, a UAH Research Institute principal research scientist. "Most of us recall extremely cold ‘polar vortex’ mornings when the stress on the power grid actually caused power outages. "Likewise, on a hot summer afternoon when all the air conditioners in town are running full blast, this can cause power outages," he says. "These peak demand periods of use keep TVA and Huntsville Utilities managers up at night worrying about how to make sure their customers don’t lose power." The smart energy configuration of the prototype Charger Energy Lab, in a building located behind UAH’s Von Braun Research Hall, reduces peak demand. If the technology was scaled up, Dr. Carswell says, it would result in smaller peak grid stress and help power companies better manage the costs of designing grids sized to handle peaks that can be many times average use. "Our studies show that, in our lab, the cost savings paid for the investment in batteries and other equipment in only 3½ years," he says. "We believe a 3½-year return on investment is good in just about any business." The Charger Energy Lab uses computer monitoring along with a smart electric meter to calculate when there are peak electricity usage times. At peaks, the system automatically switches the building off the electrical grid and onto power supplied by a battery pack in the building. The batteries are in turn recharged from the grid in off-peak hours and also through the use of solar cells located outside. The building also a diesel backup generator, so it is self-sufficient during power outages. A future natural gas-fueled generator is planned to ensure an ever-present fuel source. "When a peak demand is reached on a cold winter morning or a hot summer afternoon, the building can become an energy island," Dr. Carswell says. "It uses its own power for the high demand hours so that it doesn’t put stress on the power grid. If lots of residents and businesses were to do this, it would greatly improve the ability of power companies to provide continuous power during times of high system stress." Because high stress is dangerous to the grid, power companies charge some customers more when they use a lot of power all at once, like for heat and cooling. Utilities must charge the fee to help them pay for the equipment needed to make sure the grid doesn’t collapse under high demand, without charging extra to the average resident. This peak demand fee can be a surprisingly large part of a power bill. "When you use the technology developed in the Charger Energy Lab, you do two things: you avoid stressing the grid on cold mornings and hot afternoons and you save yourself money by not paying that peak demand fee," Dr. Carswell says. The smart meter is key to the system. "You can’t separate yourself from the grid when you are using large amounts of power unless you know, real-time, when you are using large amounts of power," he says. "Huntsville Utilities is currently field-testing a new smart meter technology to get it ready for general use. It’s called Advanced Metering Infrastructure (AMI) and you will soon be hearing a lot more about it. It’s really going to change our lives as consumers, helping us save energy, save money and create a more resilient community." Dr. Carswell is currently building a team with the goal of creating a proposed larger, commercial-scale demonstration of the technology at the U.S. Space and Rocket Center. The proposed project is geared to the introduction of AMI locally. "We envision this as a community demonstration project so that when the AMI program is in full operation, anyone in Huntsville can come see what we did and go back to a home or business and do the same thing," Dr. Carswell says. "This will make Huntsville a much more vibrant and resilient community, where users of energy have more control over how and when they use power from the grid and how much they pay. It will also improve our ability to withstand and recover from natural disasters." That’s because an added benefit of automatically isolating a home or business as an energy island is that it becomes self-sufficient in a natural or man-made disaster. "If you have this ability to become your own energy island, then if the power does go out for any reason, you can separate yourself from the grid and continue to use electricity as you normally would," Dr. Carswell says. "This is safe and convenient. Then when the power comes back on you connect back to the grid and re-charge the batteries. If the power is out for a long time, like during the 2011 tornadoes, then you can use solar power and generators to re-charge the batteries until the grid power is restored." Research and development at the Charger Energy Lab prototype has drawn together UAH students, members of the Huntsville business community and area governmental organizations. "We were allowed to take over an old, unused building at UAH to create this demonstration," says Dr. Carswell. "Fortunately, in the past the building had been used for solar power demonstrations, making our job much easier." UAH students involved in the lab are Industrial & Systems Engineering and Engineering Management (ISEEM) doctoral students Jeff Dyas and Anyama Tettey, who were sponsored by the National Science Foundation to work as lab research assistants under ISEEM Director Dr. Paul Collopy, and undergraduate students Karthik Sola in Electrical Engineering and Cathy Gibbs in Computer Science. 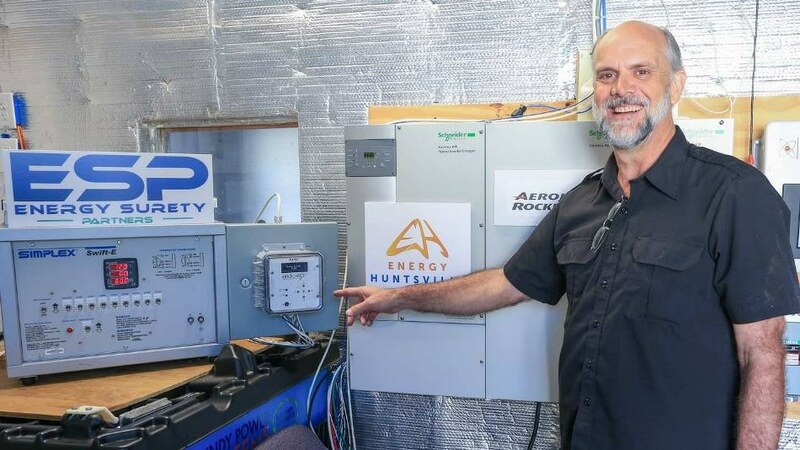 "The project at the UAH Charger Energy Lab has been undertaken without any budget to buy equipment, so this has literally been a community effort," say Dr. Carswell. "We’ve been fortunate in that several organizations have seen the value in what we are doing and stepped up to support this UAH initiative." Aerojet Rocketdyne Power Innovations, Johnson Controls Inc., Avion Energy Solutions, Energy Surety Partners and OSIsoft LLC have donated time and equipment to the effort. "We’ve also had a great deal of support from Huntsville Utilities, the U.S. Army Aviation and Missile Research Development and Engineering Center (AMRDEC), and the UAH facilities team," says Dr. Carswell. "They’ve all stepped up to make sure this project is successful and relevant to our daily lives."